The earth is being polluted in many ways. Nearly everything we do has an impact on the environment. Traffic fumes are polluting our air. 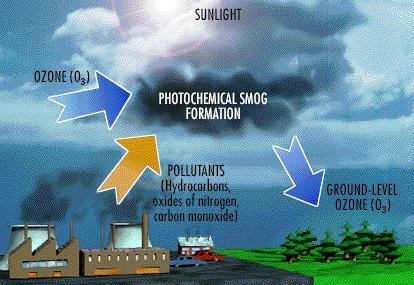 The poisonous gasses cars and lorries pump out into the atmosphere contributes to the greenhouse effect and acid rain, as well as polluting the air that we breathe. 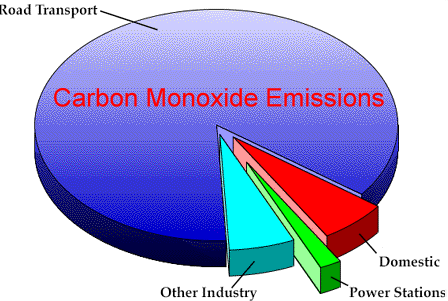 FACT:- Carbon monoxide emissions have increased by over 30% since 1980. Some of this could be reduced if we all had our cars and lorries serviced properly. In our modern world we depend on energy for many things such as lighting, cooking, heating, washing, transport and industry. FACT:- An average American home spends over $1000 a year on heating, cooling and running electric appliances. 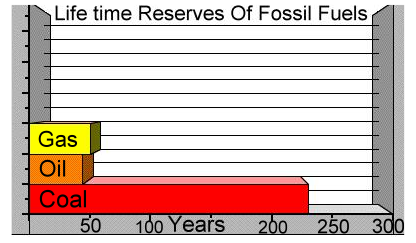 Coal, oil and gas are still our main sources of energy, but they are all limited and they will run out one day. FACT:- Try to save the energy by turning off lights, insulating buildings and servicing your heating equipment. The power stations that produce energy from these fuels, release pollutant gasses into the air, and along with industrial plants are one of the worst offenders of causing acid rain. Land pollution is also a huge problem, and each house produces tons of rubbish which has to be disposed of. About 50% of household rubbish is recyclable and some of the rest could be avoided or reused. FACT:-In the United Kingdom alone some 78,000 tons of junk mail ends up in landfill sites every year. 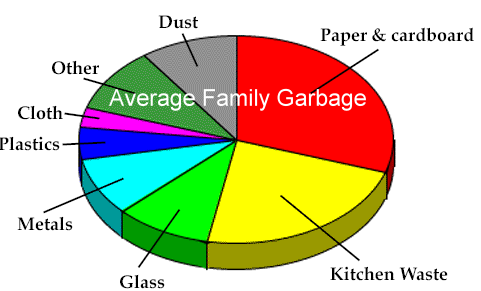 Most household waste is taken away from our homes and dumped in landfill sites. Some of these huge ‘holes’ are extremely deep 65 metres or so and covering huge areas of land. Many of these sites were created during the excavation of sand and other building materials. These materials have been sold off, although some have to be retained to cover each layer of waste and help it bed down properly. This process is then repeated until the site is almost full, then most of these sites are covered in soil. But this land cannot be used for crop growing and it is not strong enough to build upon. But some of them can be used for cattle grazing and a few have even been turned into nature reserves. But when each landfill site is finished, Methane taps have to be installed because the decomposing rubbish give off this gas and the taps help to prevent pockets of gas from building up under ground and exploding. FACT:- America currently has 6000 landfill sites, into which 80% of the country’s solid waste is dumped. The buried garbage decomposes and poisonous substances sink down deep into the soil, sometimes into water supplies. Fires on landfill site are common because of the chemical reactions taking place under ground. FACT:- One landfill site at Fresh Kills in the USA, leaks 4 million gallons of toxic fluids into the nearby streams every day! Other rubbish is burned or incinerated, but this releases toxic fumes into the atmosphere, and leaves behind poisonous ash. FACT:- Incineration is an unsatisfactory method of waste disposal. Every three tons of waste burnt, can produce as much as one ton of ash. Thoughtlessly dumped rubbish is a danger to wildlife as well as creating an eyesore. Carelessly discarded rubbish and the lack of adequate facilities to get rid of it, is causing an over-spill in our cities. Vermin thrive in these conditions leading to outbreaks of disease as well as creating an ugly environment to live in. Two thirds of the planet earth is covers by oceans. Livings in these oceans are thousands of forms of plants and animal life. Just as our countryside is being destroyed, the seas are being poisoned killing the creatures and plants that live there. All too often oil spills from tankers kill millions of fish bird and animals as well as the seaweed’s that sustain them. One oil spill can devastate an area for many years. FACT:- An average of 240 million tons of hazardous waste is generated in America each year. Waste from factories, landfill-sites, farms and power stations are accidentally or on purpose, pumped into our rivers and seas endangering fish, wildlife and swimmers. FACT:- In 1992 ministers from countries around the north east Atlantic agreed to work towards a phase out of toxic discharges by the year 2000. It also effects the purity of our drinking water as water treatment processes can only cope with certain levels of pollution, no-one know how this affects our health. FACT:- Over 100,000 cases of disease were transmitted through water in the United States between 1971 and 1985. In areas where water pollution is particularly bad, people can no longer swim, fish or participate in pastimes involving water for risk of disease. Please help us to save the Rainforests of the world. You know it makes sense! Thank you for reading this, and for your support. Data correct at time of printing.